Tuesday I had plans with my friend Katie to make another visit to the Ames hotel for dinner and drinks. I was looking forward to our friend date when I was plagued by the guilt that comes when your fridge and crisper drawer are full and you're planning on leaving town. I'm heading tonight to New Orleans, and I felt bad that I would leave food in my fridge - and it would likely go to waste by the time I returned. Katie was kind enough to entertain a change of venue (my apartment) and gladly provided libations for the occasion - it was a 'jammy' malbec with a blue label. I'll find out the name for you because it was pretty good. I had some Swiss chard, onions, and mushrooms from my Boston Organics box. A few links of leftover turkey Italian sausage, and a plethora of pantry staples. I am privy to a few of Katie's favorite things, so I decided a base of polenta would make her pretty happy - and made a polenta pie. The night before I had cooked up the swiss chard with the onions (to have some with my dinner - and save the rest for the polenta) and then I browned the mushrooms. I put everything in my fridge until the next day, and when we arrived at my place after work, all I had to do was cook up some polenta and brown the sausage. I made a super-simple polenta with water, salt, pepper, and thyme - the a big handful of parmesan cheese and a pat of butter at the end. I poured it into a baking dish and baked at 375 for about 20-25 minutes so it would form a crust at the edges. While the polenta baked I browned the sausage, chatted with Katie and drank my wine. 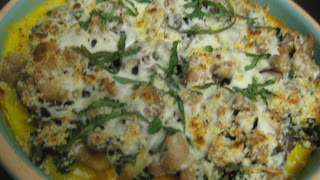 Once the polenta based was done, I added the chard, sausage, mushrooms, and a sprinkling of mozzerella and parmesan cheese to the top of the pie. I grabbed some basil from my aerogarden and did a quick chiffonade, and popped the whole thing in the oven to broil for about 5 minutes. The pie emerged slightly browned and delicious. 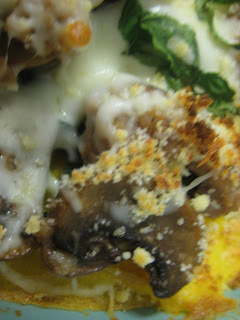 The edges of the polenta were a little browned and crispy, and then inside was creamy and rich. The texture contrast was amazing. I am also happy to report that the leftovers were also delicious the next day for lunch! 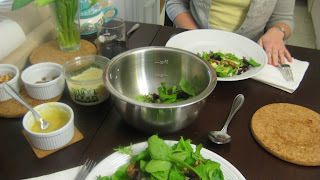 To accompany dinner we had a simple salad with blue cheese, dried cranberries, toasted pecans, and a honey mustard dressing. It was so much fun to entertain on a weeknight...and I'm very grateful that my friend Katie trusted my cooking enough to let me improvise with what I had on-hand. Now I'm off to New Orleans!! !